The internet is abuzz over Carrie Underwood’s performance on The Sound of Music Live the other night. And word on the street is that she wasn’t very good. Call me a trendsetter, if you will, but I’ve disliked Ms. Underwood for quite sometime. And it has nothing to do with the fact that she’s no Julie Andrews. supporter of the Humane Society of the United States. That sounds like a good thing, right? But the Humane Society of the United States (HSUS) is not what you think. HSUS is a political organization which spends 0.8% of its budget on animal shelters. Their advertising dollars would make you think otherwise, but their tax returns tell the truth. What does HSUS do with the rest of their $100 million annual budget? Well, 41% is spend on fundraising. That’s right. 41% of their budget is for fundraising, and less than 1% is for animal shelters. Why do they do so much fundraising, then? So they can lobby against animal agriculture and family farms like mine. I can get over the fact that Carrie’s no Julie Andrews. It doesn’t bother me that my husband thinks she’s hot. I don’t even care that she’s vegan – that’s her choice. But donating money to such a manipulative, greedy, appalling organization? That’s something I won’t stand for. I like my fellow farmers. I like local animal shelters. I like that we have food choice, including the choice to eat vegan. But I do not CAN NOT like Carrie Underwood. Did you like this post? Subscribe via email so you never miss what happens On the Banks of Squaw Creek! I don't think a lot of people realize that HSUS doesn't help out their local animal shelters like their image portrays they would. It's pretty misleading. 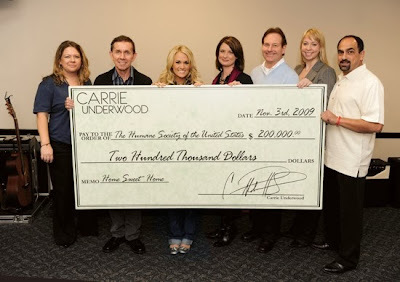 I don't like Carrie Underwood for this reason as well. And it's kind of like putting salt on a wound knowing that she is from rural Oklahoma. I think she was a farmer's daughter. But regardless if she was or not she knows how important agriculture is to a rural town and everywhere else for that matter. And now she's acts likes she's too good for it. Yes - I believe she grew up on a cattle ranch. Great post Katie! I'm with you. So many charities fail to actually support the cause they talk about, and people support them blindly. Maybe I'm biased, but I don't agree with organizations who lobby against using animals for food. ANIMALS use each other for food for crying out loud.